A book club: where everyone has great intentions to read the book but, for some reason, never seem to have the time. Either that, or the meeting itself turns out to be an opportunity to talk about everything - but the novel. In The Book Club, middle-class suburban housewife, Deb Martin seems to have found the perfect literary social club, but a few indiscretions and a blurring of fact and fiction begin to create some interesting moments for Deb. 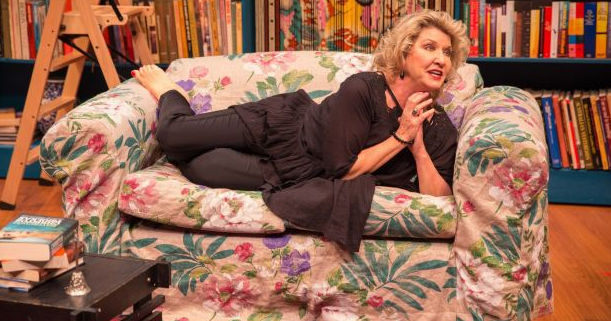 Amanda Muggleton is completely at ease with the demands of this production which, in her case, is portraying every single character – male and female – and relying on nothing but her facial expressions, body language and voice for differentiation. Her comedy timing and physicality is spot on and while she plays these characters as “big”, Muggleton still manages to retain an honesty and authenticity to them all. The story, originally written by Roger Hall and revised here by Rodney Fisher, is entertaining and fun for the most part. There are times when I felt the momentum slows a little and certain events occur merely as a device for making Deb feel even more low and ashamed of what she is doing. It's as if the script wants to push Deb so far that we have no choice but to sympathise with her, rather than trust that the audience will like her despite her actions. However, Muggleton's impressive performance and Nadia Tass' playful direction within Deb’s book-filled living room as designed by Shaun Gurton, greatly assist in getting the audience through the lags and quickly building towards the numerous climaxes throughout the show - both literally and figuratively speaking. The times when Deb goes out to the audience or acknowledges a reaction from the spectators, strengthens the relationship between us and allows for a deeper sense of empathy to be shared. While it's true what Deb says about finding happiness in a good book, you can also find it in a good show. The Book Club is an enjoyable 90 minutes of laughs that can boast a story that is well-grounded yet enticingly dramatic and scandalous, and a dynamic and engaging performance by Amanda Muggleton. *Original review appeared on Theatre Press on 28 July 2016.